Just over seven months to the day of the tragic mass shooting at the headquarters of the Capital Gazette Newspapers, State Senator Sarah Elfreth has filed legislation (Senate Bill 397) that would annually recognize June 28th as Freedom of the Press Day. 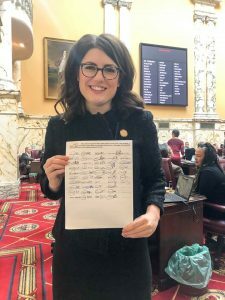 Elfreth, along with all 46 of her Senate colleagues, shared news of the legislation with constituents in a January 30th social media posting. WHEREAS, the Annapolis community, Anne Arundel County, the State of Maryland, the United States of America, and citizens of the world mourn the lives lost of these journalists, as well as journalists both domestic and international, who have died in the line of duty. Read across the desk of the Maryland Senate on Thursday, January 31st, Senate Bill 397 was assigned to the Senate Education, Health, and Environmental Affairs Committee. No hearing information is available at this time.